I didn't think I was going to enjoy How To Train Your Dragon but I was transfixed. The 3D animation was spectacular. I was completely hooked. So when Six Apart Media contacted me saying that as a publisher with their advertising network, I was now a part of their rapidly growing Entertainment initiative, of course I was interested! And especially so when the movie was another 3D animation movie. I have a reputation of being very critical of the masala movies churned out by Bollywood. The last one I had the misfortune to hit the play button on, was Singh is King and it made me want to hurl. It was worse than the usual insult-to-intelligence stuff and it did not grace my TV screen for more than five minutes. I didn't particularly fall in love with Karate Kid, even though Jaden Smith did an excellent job. 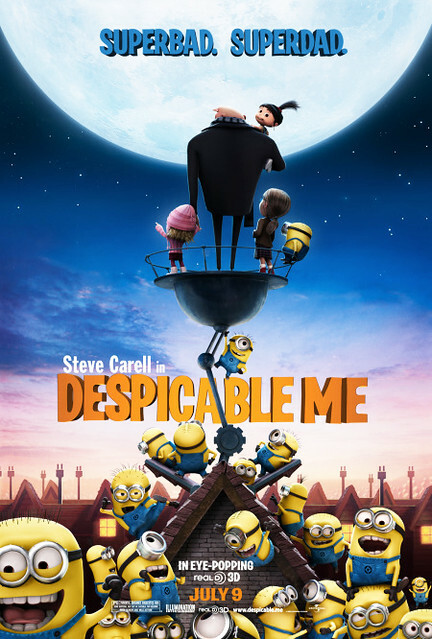 I knew that Despicable Me was going to be a soppy tale about a villain who becomes a softie because of a special treatment called unconditional love by three orphans from a home run by a despot; but even that did not deter me. 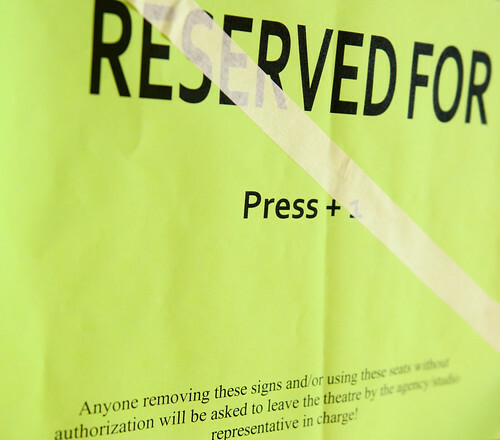 Very honestly, if the movie had disappointed, my day would have been made by Press sign that reserved our seats for us. Awwww, what a cute movie! I loved the animation, the minions and the three orphan girls with retro names: Margo, Edith and Agnes. And, of course, the villain Gru. He's extremely wicked, with plans of becoming the vilest of them all by stealing - gasp - the moon! Steve Carell of The Office fame lends his voice to Gru and Julie Andrews speaks for his mother. I didn't recognize any names from the rest of the voice credits but go take a look-see if you do. Do I recommend it? You bet! For an hour and a half of fun in 3D, heck ya! The only problem I had was finding the entrance to the darned theater. Why do they make it so difficult to find the entrance to an AMC theater from the parking lot? We're not much of cinema-goers but AMC hides its doors in the Flatirons Mall as it did in the Orchard Mall in Westminster. What's up with that? Or is it just us? Maybe it's just us. Or me. But if you can relate then maybe this next bit will appeal to you, too. Have you ever bought a whole bag of lemons when you need only a couple? Have you ever convinced yourself that you will make some of my drool-worthy lemon pickle with the rest of the sunshine in the bag? 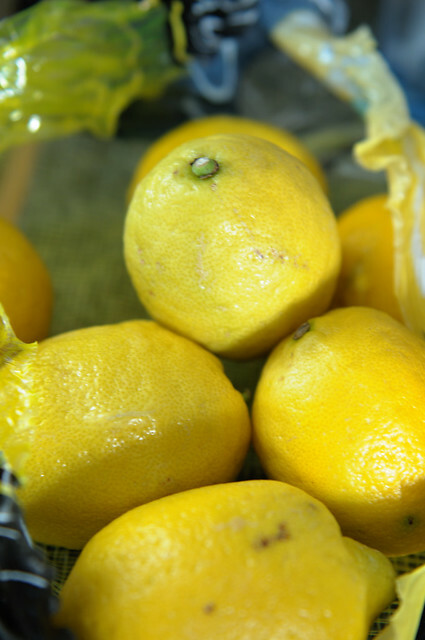 Only to find that time crept up on you and the lemons are looking more than a tad bit sad? It happens to me all the time! I also have friends who send me lemons plucked off their tree in the yard at a time when they know I am drowning in deadlines. I never complain about how these Californians show off their citrus lest it stop coming to me in the mail. So juicy and flavorful! Cover with plastic wrap and freeze. Once frozen, put them in freezer bags and bung them back into the freezer. My last batch lasted me a good six months. Yup, my friend sent me her entire crop! 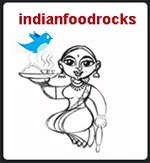 I toss frozen lemon cubes into dals and curries as they cook, and thaw them for marinades for meat and fish. 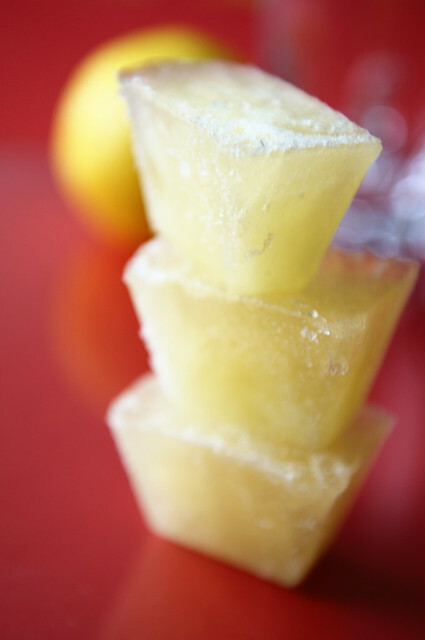 A frozen lemon cube thaws in a cinch in the microwave, with no particular loss in flavor. Three of my ice cubes make a third cup so I know approximately how much to use in my recipes. The best part is that I can also use them in my very limited mixology skills to make super-chilled drinks. Like I did yesterday, when I needed to celebrate a rather significant milestone in the weight loss adventure that I embarked on before Thanksgiving last year. I have not yet reached my goal but it's getting sweeter and sweeter with every pound that I shed. Run the lemon cubes along the rims of four tall glasses. Put the glasses in the freezer to chill. Put the salt in a bowl wider than the mouth of the glasses. 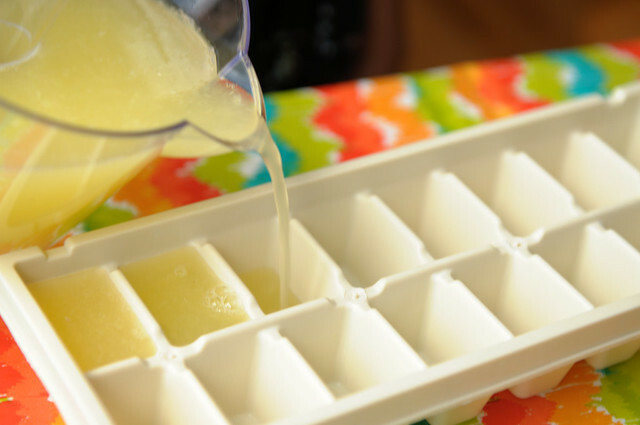 Crush the lemon cubes along with your regular ice. Combine all ingredients in a bottle and seal it. Shake vigorously until the ice is almost melted and very very cold. Move quickly from this point onwards. Pull out tall glasses from the freezer, dip the rims in this bowl. Shake off the excess and fill the glasses with ice cubes. Pour the lemon margaritas into the four glasses and raise a toast! Tequila and Triple Sec add to the calories in this refreshing cooler. But it's not every day that I celebrate losing 14.6 lbs. This post goes to Jaya's Back to Basics event. I thought I was a whole day late and begged for lenience. But apparently I am an entire month early. Who knew?! In the spirit of 3D, I made this stereoptic image that can look like a 3D image, with the lemon peel begging to be plucked out, and licked clean. Click on the diptych to open a larger image on black in new window. If you like, view this in full-screen mode. Start going cross-eyed slowly until you see a single image between the two. This part takes practice so don't give up. It will be blurry at first. Concentrate on the single image until it comes into focus as 3D. Practice, practice, practice. I couldn't see it at first either. If success still eludes you, try moving a little farther from or closer to the screen. Well? Did you see it in 3D? Nope? 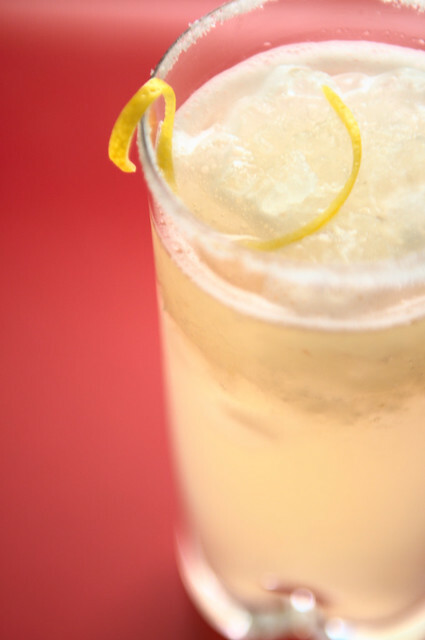 There's only one solution for that: go make yourself some chilled lemon margarita. Imbibe plenty, there will soon be enough 3D images floating around you! Disclosure: Six Apart Media, an advertiser on this blog, gave me three free tickets to watch Despicable Me at a local movie theater, before the release of the movie on July 9, 2010. I was under no obligation to write a review but I liked it so much, I thought I would. Lovely review. I will have to take my 5 yr. old to this movie. Beautiful read and a good recipe to follow. Like the icy lemons. Love to visit here often, and follow you to keep in touch. Take care. I agree with you on Singh is King movie..I could not tolerate it for long :) have a happy weekend ahead! I do similar thing. I actually bought plastic bottle dispensers and squeeze juice and freeze extra juices. and use one bottle at a time. I have to watch this movie after reading the review. Let's try it again today ( yes, I will remember to copy it before I hit 'publish'). That really is the best thing to do with limes when you have too many other things going on. It is almost as good as having fresh limes! Even my mom does this now. 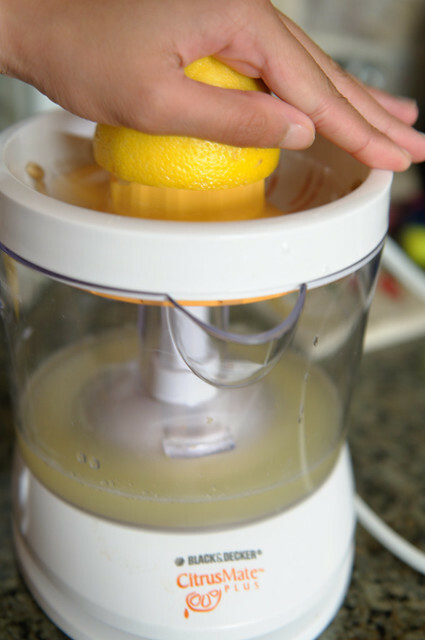 I got the idea from King Soopers - I have used their frozen limeade concentrate a few times! We too would have had margaritas that day - but no syrup, so had Toro Bravos instead. We drank to a fitter you! Priya, I hope all of you enjoy it as much as I did! Sanjeeta, thanks and have a great weekend! Mints, that's a smart idea! Anita, thanks for partying with me! Did you see the 3D image? Over on my Flickr photostream, two of my contacts confirmed that it works. And, frozen limeade concentrate? Why?! Thanks for the lemony entry and the thumbs up on the movie. We saw Toy Story 3 a few weeks ago and I saw the trailer for this one. Jaya, I still have to see Toy Story 3! Looking forward to your round-up. Anita, that's rather strange. But then, Dorothy, what did you expect?